Jump Start Productions from Brighton, visited the club on Wednesday 3rd April to show their award winning film Fractured. We were privileged to have the film producer Nathalie Grace, actress April Pearson and director Jamie Patterson attend to discuss the film with us following the viewing. Fractured won a record-breaking six awards at the 2016 British Horror Film Festival including Best Film. Left: Natalie, Jamie and April discussing aspects of the film with club members. “Jump Start Productions was established in 2009 to make innovative independent feature films. Our slate has grown to include a number of award winning films that continue to test the boundaries of indie filmmaking. We strive to promote home-grown talent and always stay true to our roots in the city of Brighton. 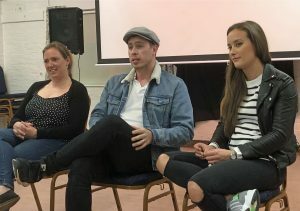 “With a group of talented and energetic filmmakers at its forefront, Jump Start Productions is ambitious in the content it produces and always faces the challenge of the British film industry head-on. Our latest film Caught has gained official selection for the 2017 Fantasporto International Film Festival, and recent feature Fractured won a record-breaking six awards at the 2016 British Horror Film Festival including Best Film. To date, we have made twelve feature films and have a number of others in development. “We strive to find emerging filmmakers and artists to collaborate with and encourage you to contact us should you wish to get involved. Fractured can be viewed on Amazon Prime, and reviews left always help the promotion of the film and Jump Start Productions. Their website http://jumpstartproductions.co.uk features all their film trailers together with information about films currently in production. Jamie has offered to come back to Ferring at some point to discuss future productions. We very much look forward to that.